Man remanded for allegedly incurring debt to Palm Court and female taxi driver. 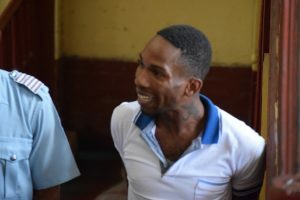 Thirty-two year old Oswin Randy Archer made appearance before Principal Magistrates Judy Latchman in the Georgetown Magistrates’ Court. Archer wascharged with obtaining credit by fraud. Particulars of the charge are that he incurred a debt of GY$21,000 by obtaining 8 Guiness, three Henessy shots, four maltas, one serving of chicken and chips, one serving of chicken nuggets and one chicken fried rice from Palm Court Restaurant and Bar and refused to pay. That incident occurred on March 6,2018 at Main Street. He pleaded not guilty to that charge. It is further alleged that Archer on March 7, at Camp Road Georgetown incurred another debt, this time to a taxi driver the sum GY$46,000 by travelling with Jamila Dazell without paying. Archer on the said day allegedly stole a cellphone from the said Jamila Dazell. To those two charges he also pleaded not guilty.